Less-than-lethal weapons, such as pepper spray, are "in-between" force choices--they're more than talking or control moves, but not as damaging as lethal weapons, like guns or knives, or even impact moves like punches and kicks..
"Ever think about a kubaton? It's a good defensive weapon, legal in lots of places, and if it isn't, you can get a pen or torch of similar size." Less-than-lethal weapons are high-tech irritants like pepper spray and electric stun guns, as well as simple tools like a kubotan keychain. "Less-than-lethal" is a bit of a misnomer, since the weapons in this category can become lethal under certain circumstances. In most cases though, the effects of the weapon are temporary, lasting just minutes, and although they can be devastatingly effective, after a few hours the offender is perfectly fine. The effectiveness of some less-than-lethal weapons is debatable. The kubotan keychain, used as intended to place pressure on the bones of the wrist or on specific nerve centers, takes some knowledge and training to use effectively. Otherwise, it becomes something to augment impact moves, like a fist strike. The kubaton, being made of lightweight plastic, is legal to carry in most places, unlike the similar-looking blackjack. Since it relies upon focusing pressure or impact force on a small area, it doesn't have the lethality problem that a lead-weighted blackjack or sap might have. Stun guns are notoriously ineffective. I've had a friend zap me with a stun gun at a local flea market. Sure, it hurt a lot, but not enough to stop me from kicking him, if I really wanted to. At best, a stun gun is a localized irritant--you could use it to startle your opponent as a lead-in to another move, like the initial grab for a joint lock, or a blitz of strikes. But I wouldn't trust it as a defensive weapon. Taser weapons, where electrical probes are shot out of a gun into an assailant, and then deliver an electric shock, are a one-shot deal. Once the weapon is triggered, it is rendered inoperable for follow-up shots. Fine if you're a cop, and you've got your handgun or long arm handy, plus several backup units a radio message away. Not so great otherwise. 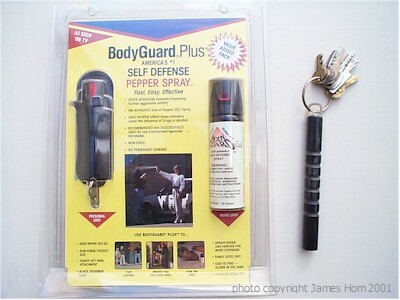 Pepper spray, on the other hand, is a very effective less-than-lethal weapon. I haven't experienced its effects myself. However, friends who have been shot in the face with a pepper spray blast as part of their law enforcement training say it rendered them useless for at least a few minutes. That's plenty of time to escape or disable your opponent. Pepper spray, as the latest in chemical irritant technology, might have its roots in the metsubushi, or irritant dust used by the ninja warriors to blind opponents. In ancient Japan, the chemicals would've been delivered through a blowgun or by throwing an eggshell full of ground peppers. Today, we have convenient pocket-sized aerosol cans. Martial artists might wonder why I advocate the use of less-than-lethal weapons at this stage of the force continuum. After all, if you're trained, you can simply escalate to the next level of impact moves. However, there's so many variables involved in a violent encounter--you can't always be sure that your training will be sufficient to handle what comes your way. Better to give yourself an advantage over your opponent from the start, by amplifying your response with a weapon. Also, impact moves, including throws, can cause serious damage to a person. A key tenet of the force continuum is to use just enough force to solve the problem--and nothing more. So if you can stop an attacker with pepper spray that will wear off in a few hours while the guy is in jail, that's better than breaking his leg or collarbone. Using the right amount of force helps keep you out of legal trouble. This viewpoint is shared by Jim Grover, the defensive tactics columnist for Guns and Ammo magazine. Grover recommends this approach not only because of the reasons mentioned above, but also because of his experience in war zones where the force continuum starts at rifle fire and goes up to air strikes. Using the less-lethal weapon would be a step down from drawing a lawfully-concealed firearm, and ultimately easier to deal with in court.